While my sweet mother-in-law was visiting last month, she was reading Susan Wigg's The Apple Orchard. 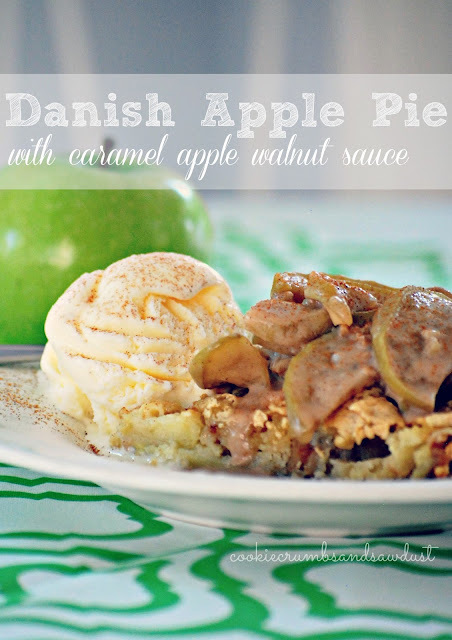 At the beginning of the book was the following recipe for aeble kage or Danish Apple Pie. My mother-in-law, who loves to cook and to bake, whipped this up for us one night. It was so good! And you know I love a good apple pie. This would be a great week night alternative to my classic apple pie, posted here. A great week night alternative to classic apple pie! Beat the egg, gradually adding the sugar and vanilla. Add the flour, baking powder, and salt and combine until smooth. Fold in the sautéed apples and the nuts. Pour into a buttered and floured 8" square pan. Bake at 350 for 30 minutes, or until firm and just browned at the edges. Cut into squares and serve with the caramel topping and ice cream. Melt the butter in a heavy pan. Add the sugar and swirl until melted. Add the spices and apples and sauté until apples are tender. Turn off heat and slowly stir in the cream. Serve immediately over ice cream or cake and keep the leftovers in a jar in the fridge. Recipe Source The Apple Orchard by Susan Wiggs. This looks amazing! I love a good apple pie! Im going to share this with my readers! Thanks so much for linking up to Financial Friday too! That caramel sauce? I think I could eat it by the cupful! I'm pinning this for sure! :) Visiting from the Sundae Scoop link party. I'm Danish and I can hardly wait to try this recipe. Thank yo so much for sharing it on your blog!